Basement Bars | Classic Bars, Inc.
Make Your Basement the Focal Point of Your Home! 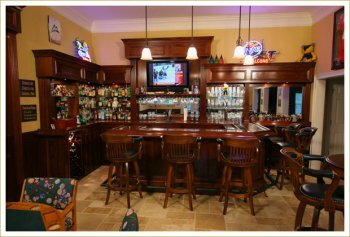 At Classic Bars, Inc. we can build and install custom bars in every space of your home. Basement bars are one of our most popular requests, as we can transform wasted cellar space into amazing entertainment areas. Our design team is highly skilled at maximizing basement space and implementing low profile appliances for your conveniences. Classic Bars, Inc. will ensure that every detail you require for your dream home bar is to your standards. Renovate your basement for fun and entertainment with a custom bar complete with personally tailored details like handcrafted medallions and decorative columns. Speak with one of our consultants about bar styles like classic, contemporary, and industrial for ideas for your basement build. Our professional team can work within whatever space is provided. Call us at (404) 350-9806 for your free quote and get started on your basement bar.